The designer paper on this card is by Making Memories. I sponged a bit of Tea Dye Ink (Ranger) on the edges to age it a bit. For the sentiment, I inked only part of a stamp from the Tiny Words & Centers set (JustRite). I framed the sentiment with a Chatterbox Brad -Easy Bradmaker Kit (LOVE this kit!). The final touch is a piece of olive ric rac under the main image. 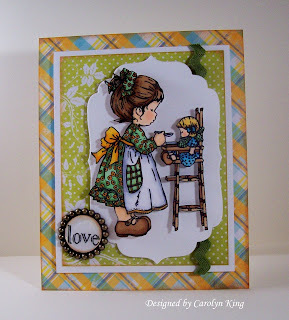 Check out Stamper's Dream for most of the supplies used to make this card! Materials used: Stamps-Picnic Time (Sarah Kay for Stampavie), Tiny Words & Centers set (JustRite Stampers); Memento black ink; Ranger Distress Tea Dye Ink; sponge; SU black marker; white cardstock (PRISM); Designer paper--Just Chillin' Girl 6 x 6 paper pack (Making Memories); Copic Markers; Spellbinders Labels Four Nestabilities; Cuttlebug (Provocraft); olive ric rac (May Arts); Easy BradMaker Kit (Chatterbox). My baby sister is flying in tomorrow with my niece (1) for a week----we are all soo excited! Hope you have a great weekend!!! This is gorgeous! And of course your coloring is fab too!!! Have a great week visiting with your sister and niece! OMG - you cut that out?!?!?!? That is amazing! Your coloring is so super wonderful and the card is beautiful! Have a wonderful weekend. Beautiful! She is so darn cute and I like how you singled her out on that fancy nestie. What a lovely card! I love these Sarah Kay images, but have yet to purchase any. But everytime I see a card made with these images, I'm tempted! Just gorgeous! Have fun with your little sis and her baby!! Such a pretty card. I love the Sarah Kay stamps. Enjoy the weekend. How precious. I just love that stamp! Your coloring is great! Such a sweet card. Reminds me of my Mrs. Beasley or Holly Hobby doll. Have a beautiful weekend! This is sooo very adorable, Cammie!! Wow, your coloring rocks!! Girl, you really did a fabulous job with that stamp! Your coloring is simply gorgeous, and I love your expert cutting! Love the Labels 4 nesties too. Great job! Oh my goodness Cammie this is gorgeous hun! AWESOME coloring...your image looks so professionally done! Great work hun! Fab coloring on your sweet image, Cam! Have a great time with your fam! Love this sweet stamp, and your card is just adorable!! Enjoy your sis and niece! In a bout two weeks, I'll be moving only about two hours away from my baby sis and two nieces! I am SO excited!! Very precious card! Your coloring is always inspire me! Enjoy yout time with your family! Oh sooooo adorable! This is awesome Carolyn, I luv it!!! This is such a sweet image, and your coloring looks so great that I thought you'd actually paper-pieced her dress. ;) Darling card. This is utterly adorable!! You are a coloring goddess!! This is so darling, Cammie...and your coloring is amazing!! Love your Boho card too!! Absolutely darling!! Your coloring is fantastic!! Love the papers you used too!! This is gorgeous Cammie! What beautiful colouring! This is beautiful, Cammie! Your Copic coloring is just amazing!